What Must a Motor Dealer do to get IGF Cover? 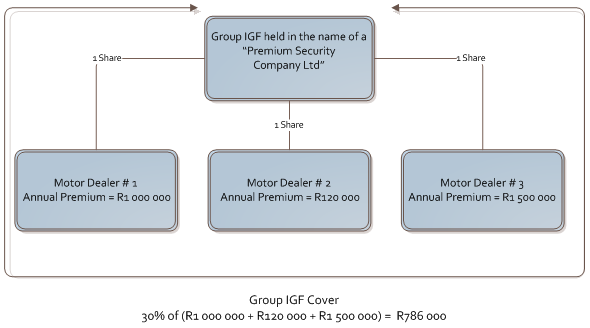 The Short Term Insurance Act 1998 requires a motor dealer to have IGF cover for an amount equal to 30% of the gross premiums collected in the preceding year. 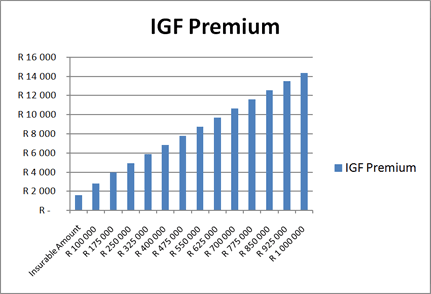 This means that if the dealership collected R1 000 000 gross premiums last year, it must have IGF cover for R300 000. The solvency requirements for any person who wishes to obtain IGF cover are stringent. The maximum guarantee that will be issued by the IGF is an amount equal to ten times the net annual income of the motor dealers business. Net income before tax will be adjusted for significant directors' emoluments and administration fees and a ratio of 10 will be applied to the result. In other words, the adjusted annual net income of a dealership with its own FSP licence must be not less than R100 000. If the net income is found to be sufficient, the dealerships net current assets must not be less than 20% of the amount of the guarantee required. Current assets are assets that can be liquidated or converted to cash within a year. Prepaid expenses- for example, if we paid insurance for the entire year in advance, then after 6 months we still technically have half of that payment in assets. In other words, the net current assets of a dealership with its own FSP licence must be not less than R200 000. Is there an Alternative to IGF Cover? In short the answer is YES – but the alternative is very strictly defined. A motor dealer may ask a bank to issue a guarantee instead of making any application to the IGF.However, it is essential that the bank issue the guarantee in a very specific format. The Regulations (see below) provide that the bank guarantee must be issued in the format determined by the Registrar. This format was given in Board Notice 192 of 1998 in a Government Gazette dated 24th December 1998. A copy can be viewed here. The guarantee must be issued in respect of the obligations of the motor dealer. The Regulations in question are set out below. Please note that an "independent intermediary" means a person who renders services as intermediary and "services as intermediary" means any act performed by a person the result of which is that another person will or does or offers to enter into, vary or renew a short-term policy or any act performed by a person with a view to collecting or accounting for premiums payable under a short-term policy. A short-term insurer may, subject to subregulation (2), in writing authorise an independent intermediary to receive, hold or in any other manner deal with premiums payable to it under short-term policies. a contract which, but for the fact that the undertaking concerned is given by a bank, would be a guarantee policy, and under which policy benefits are to be provided in the event of the failure of that person to meet those obligations. The significance of this is that a motor dealer who collects premiums on short term insurance products falls within the definition of an independent intermediary. It matters not whether he is a juristic representative of some other entity for FAIS purposes or whether he is a member of some or other Umbrella Scheme: if he collects premiums he must have IGF or an alternative form of cover. In essence then, if a motor dealer is able to obtain a guarantee from a bank, the guarantee must be in the form of the as set out in Board Notice 192 of 1998 and must be in favour of the Dealership generally. It is not possible to limit the guarantee to premiums collected for any nominated insurer or warranty provider. The guarantee is in respect of any and all premiums that may be collected by the dealership. Group IGF Cover - Is It Possible? There are structures that have been established in an attempt to assist motor dealers to continue to receive premiums without having to go to the enormous trouble of finding adequate IGF cover. These Group Schemes all require motor dealers to buy shares in a dedicated special purpose company. the group of motor dealers on whose behalf the collective security is held, whether incorporated or unincorporated, may not self-insure by paying premiums to an insurer on behalf of a defaulting motor dealer, without calling the bank guarantee or instituting a claim under the guarantee policy. Each motor dealer who collects premiums must be specifically referred to in the IGF policy. Each motor dealer who collects premiums must be specifically authorised in writing each insurer on whose behalf premiums are collected. Avoid the hassle and let Debella collect premiums for you.